Batteries contain sulfuric acid which is highly corrosive. Do not allow acid to contact your eyes, skin or clothing. If acid gets into your eyes, flush your eyes with clean water for at least 15 minutes and get immediate medical attention. If acid gets on your skin, thoroughly wash the area. If you feel pain or a burning sensation, get medical attention immediately. Only use a 12-volt power supply (battery or jumper system) to jump start your vehicle. Do not attempt to jump start your vehicle by push-starting. 1.Position the vehicles close enough that the jumper cables will reach, but do not allow the vehicles to touch. 2.Avoid fans or any moving parts in the engine compartment at all times, even when the vehicles are turned off. 3.Turn off all electrical devices such as radios, lights, air conditioning, etc. Put the vehicles in P (Park) and set the parking brakes. Turn both vehicles OFF. 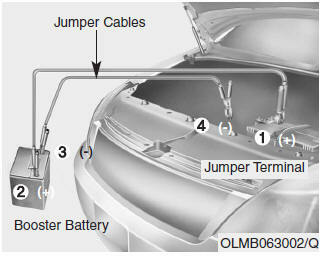 4.Connect the jumper cables in the exact sequence shown in the illustration. First connect one jumper cable to the red, positive (+) jumper terminal of your vehicle (1). 5.Connect the other end of the jumper cable to the red, positive (+) battery/jumper terminal of the assisting vehicle (2). 6.Connect the second jumper cable to the black, negative (-) battery/chassis ground of the assisting vehicle (3). 7.Connect the other end of the second jumper cable to the black, negative (-) chassis ground of your vehicle (4). Do not allow the jumper cables to contact anything except the correct battery or jumper terminals or the correct ground. Do not lean over the battery when making connections. 8.Start the engine of the assisting vehicle and let it run at approximately 2,000 rpm for a few minutes. Then start your vehicle. If your vehicle will not start after a few attempts, it probably requires servicing. In this event please seek qualified assistance. If the cause of your battery discharging is not apparent, have your vehicle checked by an authorized HYUNDAI dealer. 1.Disconnect the jumper cable from the black, negative (-) chassis ground of your vehicle (4). 2.Disconnect the other end of the jumper cable from the black, negative (-) battery/chassis ground of the assisting vehicle (3). 3.Disconnect the second jumper cable from the red, positive (+) battery/ jumper terminal of the assisting vehicle (2). 4.Disconnect the other end of the jumper cable from the red, positive (+) jumper terminal of your vehicle (1).